Want to get rich and get a steady 50K per year paycheck for the next 20 years (which totals up to 1 million)? You can with Mcdonalds Monopoly Online, but you gonna be fast cause it’s only running till November 2nd only. 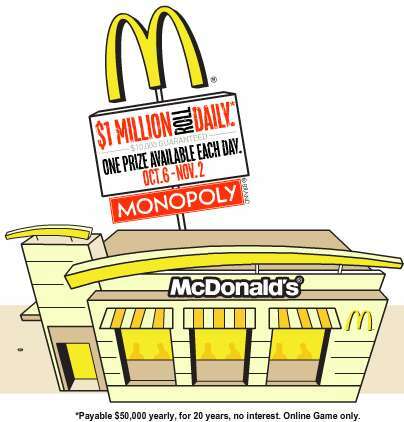 Until November 2nd, you can use game pieces from McD’s food items and go online for a chance to win all kinds of prizes, including cash, coke points, free McD’s food, Shell Gift cards, X-Box systems, the $100,000 jackpot, or a million dollars (given away every day). Land on Chance Online and receive as a prize the results of a MONOPOLY® Dice Roll to occur the following day. A roll of two sixes (6&6) results in a $1 MILLION prize, payable $50,000 per year for 20 years without interest; for any other result, winner receives $10,000. See roll results at PlayatMcD.com. $1 MILLION daily opportunities (U.S. & Canada combined) Online October 6, 2009 – November 2, 2009 (12:00:00 midnight ET to 11:59:59 pm ET). I’m too lazy to read the fine print and not interested in winning (it’s too much work+luck and I hate fast food anyway). But you can play it here. Let me know if you won anything. * Looks like a good marketing campaign and it’s getting lots of attention. Cash prizes never fails. But the fact remains that fast food makes you fat. I have all 3 stamps of the orange New York tennesse Avenue and st.James place for 1,000 . how to claime my winnings.